The consultants were very delightful to work with, helping me with decorating & color match . The installers were very professional with high quality work. – Marry L.
I went to several places in Kingman for flooring and stopped when I stepped in Cyndi’s store. Not only was she reasonable but very helpful too. She is very personable and made me comfortable. 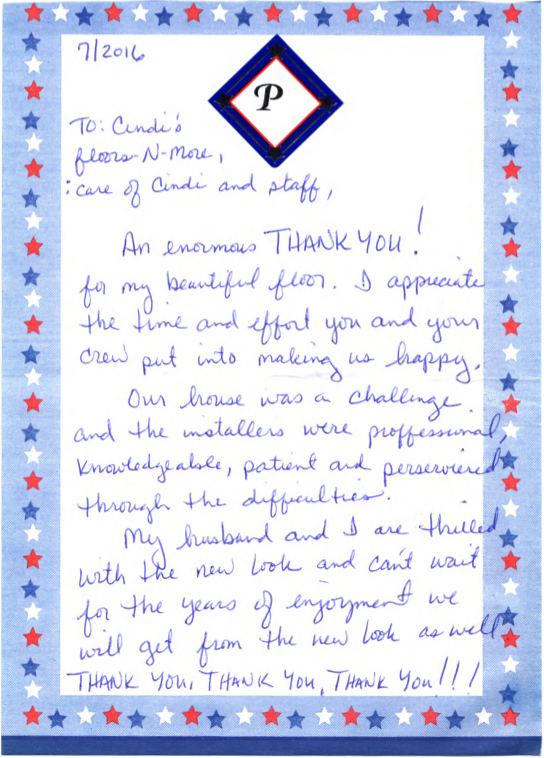 I would highly recommend anyone seeking floor covering to see Cyndi. The installers were quick and efficient. – Cory B. 5 stars! Why anyone would go anywhere else for flooring is beyond me. Great customer service. Great prices, and great installation. – Henry H.
I had them do 3 bedrooms of carpet. The installers were fast, clean, and very professional. Would recommend Cyndi to anyone! – Matt H.
I wanted to let everyone know that the only place to get tile and have it installed is with the best of the best, Cyndi’s Floor and More . I went to her business and was greeted with a very friendly woman who was right their to help me find the perfect tile. Then she came to my house that day to measure my bathrooms and hallway and living room. She spent time with me on the design of the tile I was going to get. I had one on one consulting with her. Her tile crew came to my house and gave me the utmost respect and very professional and away they went. I could not believe how perfect every tile was in place. No mess after each visit. I am so happy with the work that was done on my floors. I would recommend Cyndi’s Floor & More if you want the best!!!!! LOOK NO MORE. – Helen C.